Wool is nature's miracle fabric, and hikers have long preferred wool hiking socks. 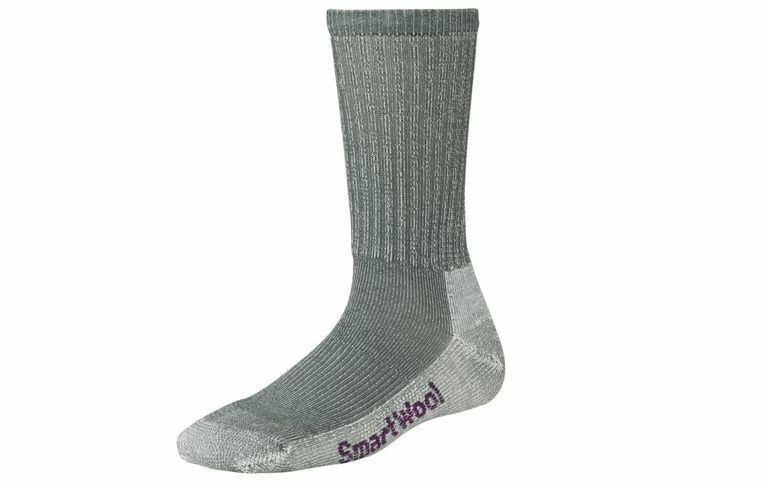 Smartwool socks are one step better because they are itch-free, machine-washable and won't shrink in the washer or dryer. They are great socks for winter walking, and many people like to wear them all year-round. Shrink-free. You can wash and dry them in your washing machine and dryer. Crew sock length with medium padding for hiking shoes or boots. Thin, flat instep for more breathability, keeping your feet cooler and drier. Elastic in the arch helps support the arch and provide a snug fit so the sock doesn't bunch up. They have flat-knit toe seams for comfort with less chance of rubbing and causing blisters. Higher density yarn is used in the areas that wear more, the metatarsal area and the heel, so the socks will be more durable. Some people will still be sensitive to wool and will still feel a little itchy wearing even itch-less wool socks. Smartwool promises a better wool sock. Wool can keep you warm in the winter but yet works well to manage temperature and moisture in summer. Hikers have long preferred a wool hiking sock but often used a polypropylene liner sock. You don't need the liner sock with Smartwool socks if you are using it to prevent the itchy feeling wool gives many people. The fibers of Smartwool don't have the barbs found on untreated wool. However, I must confess that I did feel some itchiness after several hours (I am especially sensitive to wool). However, any slight sensation I felt was far less than the instant "get these off my feet" I feel with regular wool socks. Smartwool light hiker socks are made with a blend of 73% Merino wool, 26% Nylon and 1% elastane. The socks are made in the USA of imported yarns. The construction includes compression and flex zones so the socks hold its shape and support your foot throughout a walking step. While traditional wool socks must be hand washed, you can wash Smartwool socks in the washing machine and dry them in the dryer and they will maintain their shape and won't shrink. The laundry instructions are to machine wash with warm water, use the gentle cycle, and do not use bleach. Tumble dry on low temperature in your clothes dryer. Do not dry clean. Meanwhile, our gear advisor Richard Bumgardner loves these socks. These light hikers are designed for wearing with hiking shoes or boots. They provide superior natural moisture control and temperature control. A wool blend sock can help prevent blisters, especially when compared to a cotton sock. Wool and nylon absorb and transport foot sweat and moisture so it evaporates rather than remaining on the foot and softening the skin. Hot, wet skin is more likely to form blisters with friction. The anatomic construction of the sock also helps prevent excess bunching and friction that can occur with tube socks. The flat seam construction at the toe also helps relieve a common area of rubbing and friction. These socks may be thicker than your usual socks. Be sure to try on socks with the shoes or boots you will be wearing to ensure they are the right thickness. If you have diabetes, these socks may also be beneficial in helping to prevent blisters. You can discuss this with your doctor, physician's assistant, nurse practitioner, or diabetes educator to ensure these socks have the features that are what she would recommend for you and your medical condition. Smartwool light hiker socks come in both men's and women's designs, as there are gender-based differences in foot shape. The crew length works well with boots and for winter wear.